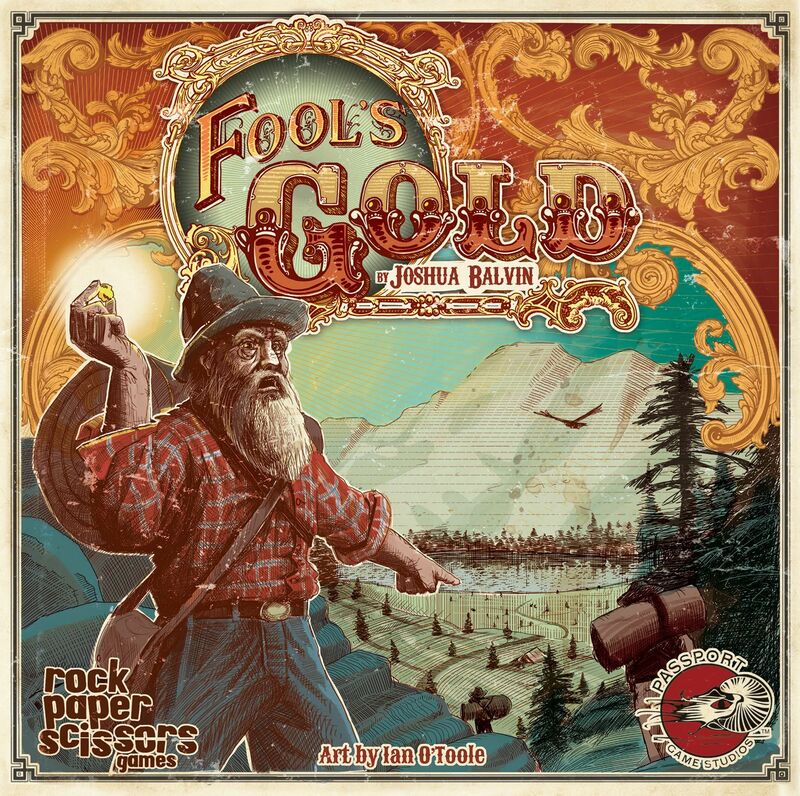 Fool's Gold takes place during the gold rush of 1849. Players are investors who send prospectors on a quest to find gold at various locations — in the mountains, in a forest, at a river, etc. — with each location having perils, gems, quantities of gold and bountiful supplies of silt. As players remove valuable gold cards from the location decks, silt becomes more prominent and gold harder to find. Place a prospector on a mine path, paying the cost of the space you cover; whenever you pay coins, place them in front of your player screen. Place a wild die on a mine path, paying 1 for each die already on the path. Place a prospector in front of your screen to take back three coins. Pass, place all of your remaining prospectors in reserve next to any mine or mines of your choice, then take back all coins and prospectors in front of your screen. Take a gold card from the mine. Take a gem card from the mine, but only if you don't already have this gem. Take two coins from the bank, which gives you additional funds for the rest of the game. Lay down your prospector (removing it from priority) and wait for winter. Once all standing miners have been removed, roll the winter die and draw that many cards for winter. If any goods come up, those layabout prospectors finally get to profit; if not, tough cookies, sourdough! After five rounds, players compare their findings, losing points if they've failed to collect gold from each mine. In addition, each player must throw out all the gold from the mine where he found the most. Turns out it was so easy to find because it was fool's gold! Players then sum their nuggets and score 1-15 points for their gem collection. Whoever has the highest score wins!